The Brown corpus (full name Brown University Standard Corpus of Present-Day American English) was the first text corpus of American English. The original corpus was published in 1963-1964 by W. Nelson Francis and Henry Kučera at Department of Linguistics, Brown University Providence, Rhode Island, USA. 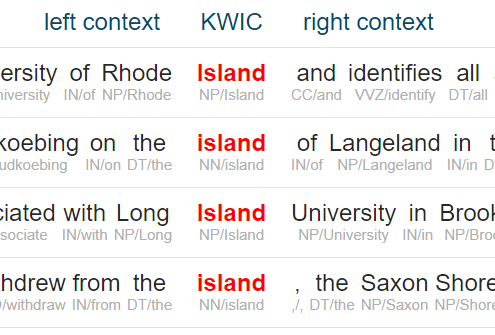 This is an extended corpus of the Brown corpus which includes also the Lancaster-Oslo/Bergen Corpus (LOB), Brown’s British English counterpart, as well as Frown and FLOB, the 1990s equivalents of Brown and LOB. The corpus consists of 6 million words in American and British English. The Brown corpus is PoS tagged with the Penn TreeBank tagset. The Brown family corpus has POS tags from the CLAWS tagset version 7. The access to the corpus is freely available for research. A Standard Corpus of Present-Day Edited American English, for use with Digital Computers (Brown). 1964, 1971, 1979. Compiled by W. N. Francis and H. Kučera. Brown University. Providence, Rhode Island. Sketch Engine offers to search the Brown corpus online now. Sketch Engine provides access to 400+ language corpora in total.